16,000 sq. 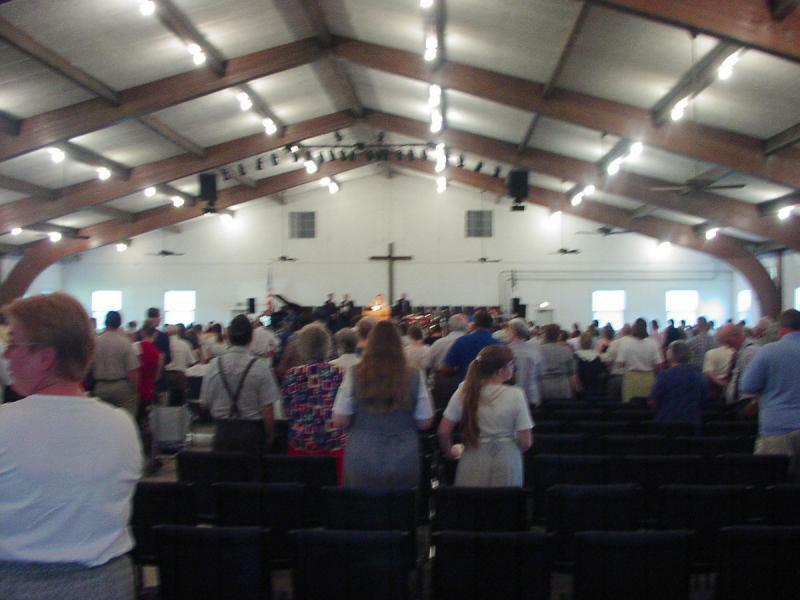 ft (160’ X 100’) - The Tabernacle will seat about 900. It has central air conditioning, carpeted platform, quality sound system, men & women’s rest rooms plus a handicapped restroom and comfortable interconnected chairs. The Tabernacle also has heat strips in the HVAC unit so it can be made comfortable with outside temperatures as low as 45 degrees. 4,500 sq. ft. - The Eagle House has two large meeting rooms divided by a kitchen area. Rest rooms are also provided. The building has central air conditioning and heat, and is insulated for year round use. It has a beautiful fireplace which makes it perfect for winter retreats. Dining Room, Kitchen (Pitts Building) 7,200 sq. ft. - The Dining Room and Kitchen are heated and air conditioned for year round use. The dining area is carpeted and includes a divider so the area can be split into two sections. The kitchen includes commercial ovens and freezers. There is also a platform/stage area. Rest rooms are located in the entry area. 6,500 sq. ft. plus 800 sq. ft. for restrooms and showers - The Gym has a basketball court, showers and rest rooms. It is heated and air conditioned for year round use. A great place for playing basketball, volleyball and soccer. Also a great location for any activity that requires a large open space. 7,800 sq. ft. on two floors - The Lodge was completely remodeled in 2015. There are 21 rooms with private baths. Two rooms are handicap accessible. There is a combination of full size and bunk beds. The lodge has central heating and air conditioning and is designed for year round use. Sleeping capacity as furnished is 117. 5,800 sq. ft. on two floors - Shepherd Hall is heated and air conditioned for year round use. There is one apartment with kitchenette, two sleeping rooms and bath. There are 7 other sections of three sleeping rooms and a bath for each section. Sleeping capacity is 46. 3,070 sq. ft. –Newly renovated in 2014 this building features central heating and air conditioning and a meeting room that will accommodate 15 that connects to a full kitchen. This building works great for church board retreats, and family reunions. Sleeping capacity is 37. 2,970 sq. ft. –Summer bunkhouse with 4 sections. Each section has bunk beds for 20 people and a restroom & shower. Sleeping capacity is 80. Central Air and Heat were installed in 2013. The shaded RV Park has space for 46 units and includes 50 amp electric service, as well as water and sewage hook-ups. Also included on the 35 acre property are numerous cottages, a bookstore and a snack shack.